The first quarter’s economic performance will reflect many of the forces created at the end of 2018. These forces included: the sharp equity market decline near year end which tightened financial conditions resulting in the Fed moving to a more dovish monetary policy, the uncertain outcome of the Sino-U.S. trade war, the fourth quarter inventory build to beat expected January tariff increases, and the partial closing of the U.S. government. At this point, the Atlanta Fed’s blue-chip economist forecasts call for first quarter GDP growth to average 1.5%. In comparison, the Atlanta Fed’s “GDP now” forecast projects growth below 1%. The remainder of this commentary will primarily examine how these fourth quarter forces will influence economic growth in 2019. 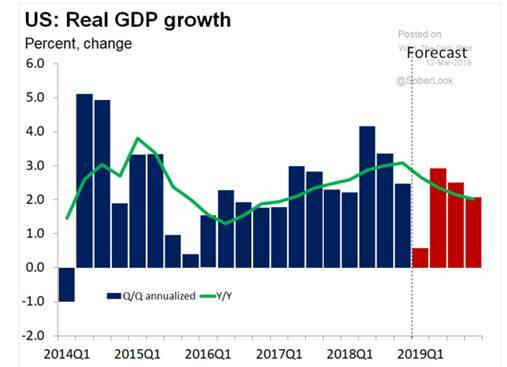 Historically, in part due to seasonal adjustment factors, the first quarter GDP growth shows a significantly smaller contribution than the following quarters (see figure 1.) Admittedly, the nearly decade long economic growth helped create the consistency of that seasonal pattern. The 2019 quarterly GDP forecast from Oxford Economics mimics that pattern (see figure 2.) 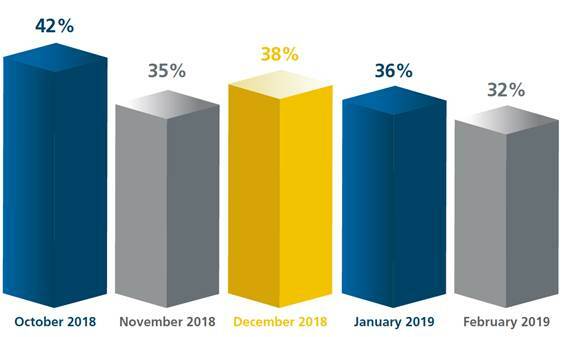 Overall, most economists look for the 2019 GDP annual growth rate to come in somewhat above the economy’s potential growth rate of nearly 2%. The year-end stock market selloff likely depressed fourth quarter household net worth. In that quarter, net worth experienced the sharpest decline, 3.5%, since the global financial crisis (see figure 3.) According to a recent article in The Washington Post, the top 10% of families own about 84% of the stock market. Therefore, in our view, the market decline likely caused many of these families to hold back on their holiday spending. If so, it helped contribute to lower retail sales in December. The continuing trade war resulted in the building of fourth quarter inventories to offset threatened January tariff increases. 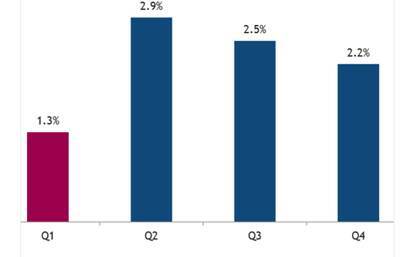 The holdover effect from the working down of inventories will depress first quarter GDP growth. The Atlanta Fed’s “GDP now” quarterly forecast estimates reduced private inventory levels will shed roughly 0.6% from first quarter growth. A survey from The Wall Street Journal/Vistage Small Business CEO Survey showed a third of CEO’s businesses negatively impacted by higher tariffs (see figure 9). 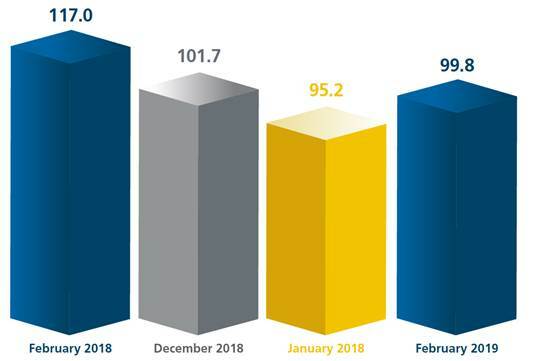 At the same time, their confidence seems somewhat improved (see figure 10–the graph should read January 2019). 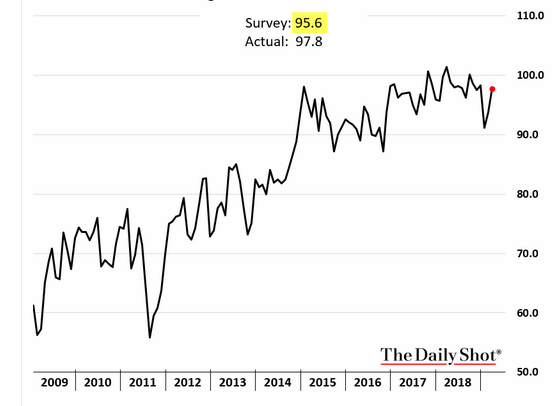 With the growing likelihood of a trade war settlement sometime early in the spring, business optimism may regain strength at that time to the benefit of capital spending later in 2019. At this time, the decline in small business expenditure plans seem to be bottoming (see figure 11.) All of this potential awaits a trade war settlement. 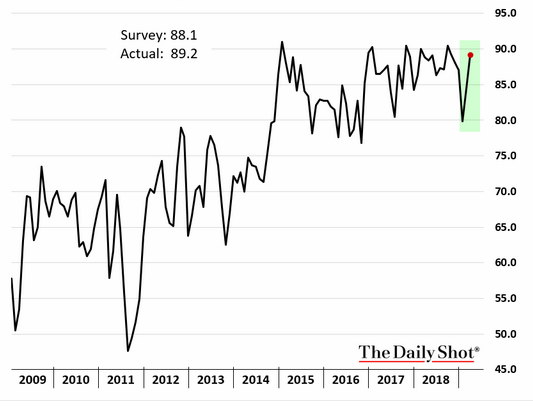 Some economists and well-known fund managers express concern about a modestly growing probability of recessionary forces showing up later this year. From our perspective, there seems little excesses in the traditional economy at present to come to that conclusion. In our view, a potential recession would more likely come from financial market instability than the economy itself. This small possibility might result from the significant level of corporate debt refunding coming due beginning in 2021. In the meantime, with a shortage of growth, stocks of companies that can show steady above average growth through this period should benefit. With rising labor costs possibly squeezing profit margins, revenue growth will be more important to produce earnings growth. 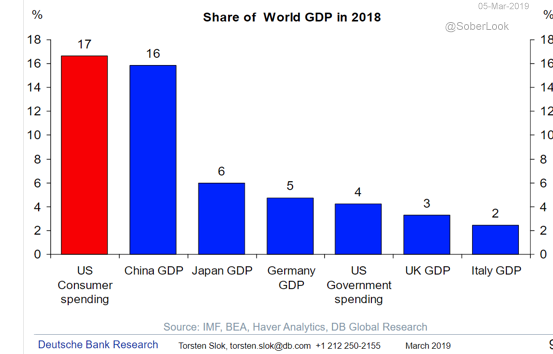 If the overhanging uncertainties from the trade war can be lessened or removed, the possibility exists that the economy could show some, modest upside surprises in the second half of the year. 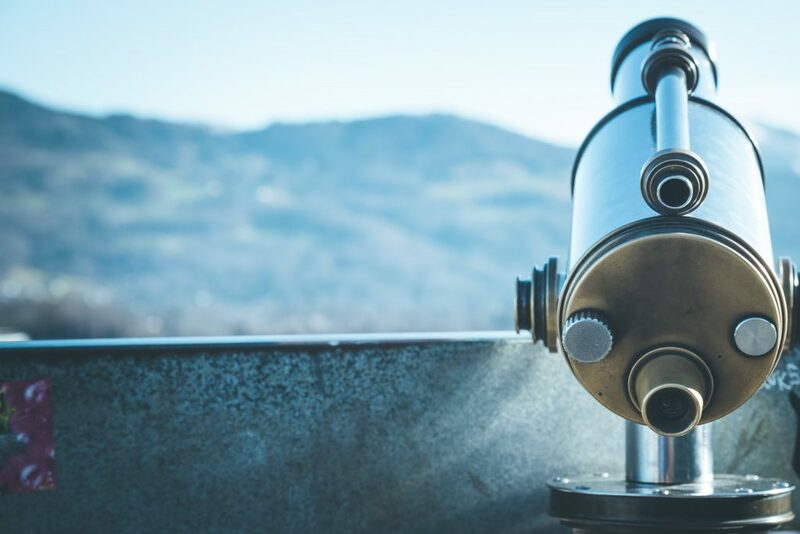 With continuing uncertainties from the trade war, an equally balanced portfolio of equities, alternative investments, and short duration fixed income securities seems appropriate at this time.